The reassigned spectrogram is a special graphic time / frequency representation; especially suited for "fast" spectrograms. Compared with the classic spectrogram (aka 'waterfall') display, reassigned spectrograms can offer better resolution in the time- as well as in the frequency domain. The reassigned spectrogram shows a much 'sharper' image than the classic spectrogram, as long as the criteria for separability are fulfilled, and the signals have a sufficient signal-to-noise ratio. The principle of time/frequency reassignment is described further below; several in-depth articles about the topic can be found through a websearch. The display settings, and the configuration of the test signal generator are contained in the configuration 'reassigned_spectrogram_test.usr' . How to load such files into SpecLab is explained here. The test signal was produced with SL's test signal generator. It consisted of..
A sine wave, frequency modulated with another sine wave. Modulation frequency: 10 Hz, frequency deviation 1000 Hz . See also: Spectrum Lab's main index, display settings, Controls on the left side and on the bottom of the main window (separate documents). The classic spectrogram plots the magnitudes found in each frequency bin. It discards the phase information from the short-time fourier transform. 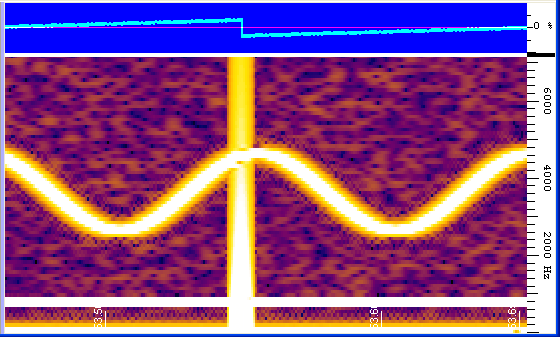 The reassigned spectrogram tries to "sharpen" the time/frequency display by using phase information from the complex short-time fourier transform (STFT). For example, by comparing the phase between two neighbouring frequency bins (within the same STFT) it is possible to relocate the energy from that cell along the time(!) axis. By comparing the phase in a frequency bin (between two neighbouring STFTs), it is possible to relocate the energy from that cell along the frequency(!) axis. Details, and implementation notes can be found in the literature; some articles are listed further below. To use the reassigned spectrogram effectively, one doesn't have to understand exactly how it works; but it's important to know the limitations. If two different signals are present in the same cell (overlapping in time, and/or in frequency), they cannot be separated. 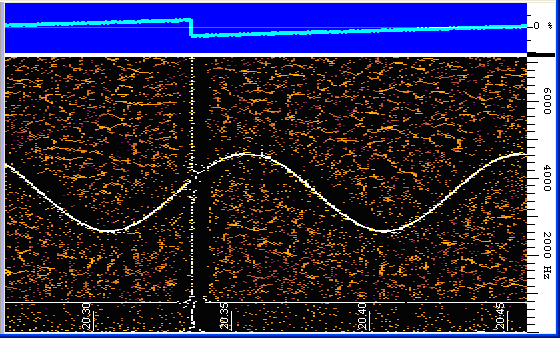 At the intersection between the vertical line (= the sharp falling edge of the sawtooth signal) and the slow frequency modulated sine wave, some pixels appear "scattered". The width of one FFT frequency bin is small enough (and thus the FFT window time large enough) so that two signals never fall inside the same FFT frequency bin. These important parameters are summarized on SpecLab's FFT configuration tab (from the main menu: "Options".."FFT Settings"). In this example, two signals can only be separated (i.e. produce a "good" time/frequency reassigned spectrogram) if they are separated by at least 129 Hz (in frequency), or by at least 12 milliseconds (in time). Too small FFT size -> poor frequency separability, but good time separability . If there is only "one" signal (or a large separation between two signals, in time and/or frequency), the selection of the FFT size is not as critical as when there are two or more signals close to each other. It is advisable to use the "automatic scroll speed" for the spectrogram, and use an overlap (between two STFTs) of 50, 75, or 87.5 percent. Then, the FFT size will also set the scroll speed (aka 'frame advance'), so there's not too much "smearing" along the time axis. The preconfigured settings in Spectrum Lab's Quick Settings menu may help to find a good starting point for a certain application. "Algorithms for computing the time-corrected instantaneous frequency (reassigned) spectrogram, with applications"
by Sean A. Fulop and Kelly R. Fitz, (c) Acoustical Society of America, 2006 .